In May Tara and I joined a University of Alberta undergrad field class run by Clive Coy, Eva Koppelhus, and Philip Currie. The class taught excavation technique in an Edmontosaurus bonebed approximately 70 millions years old, in a park just outside of Edmonton. It was unseasonably hot in Edmonton in May. This was the day the Fort Mac fire hit the town, 300 kilometres north. We flew to Alberta to interview Philip and Eva in their lab at the University of Alberta – a quiet place to explore the "idea" portion of palaeontology. 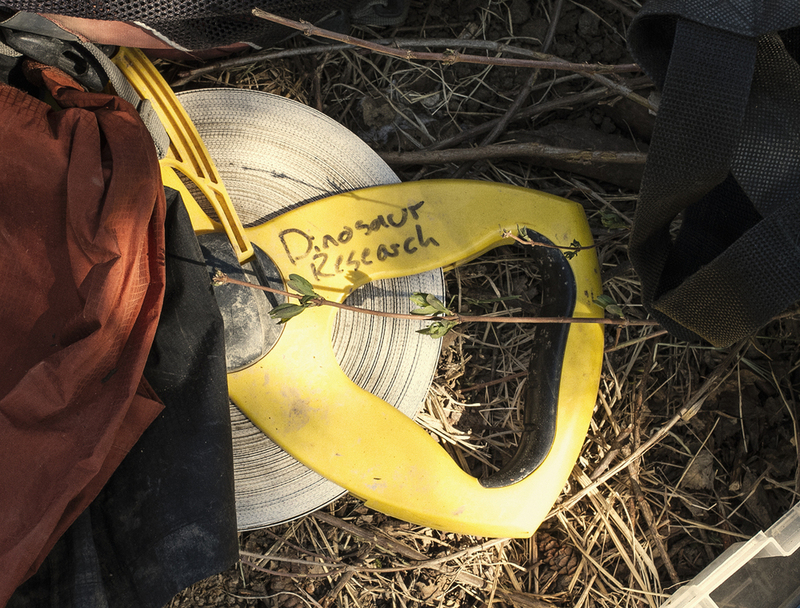 A paleontogist's year is split in two – the summers are spent in the field prospecting and excavating, and the winters are spent in the lab preparing specimens and formulating ideas and theories. There's something about this seasonal flip between the extremes of indoor and outdoor that we'll talk about soon, but back to the dig. Some years the field class is held in snow, the ground still frozen. The class is planned far in advance, no one knows what the conditions will be. This year it was 30 degrees, no humidity, too early for bugs – a perfect day to dig. We dropped the plan to shoot in the lab and focused on the dig. The undergrads are from all over the world – studying under Phil and Eva is that big of a deal. There were students from Brazil, Australia and Japan, and boy, did they work hard. There's a palpable sense of purpose, drive and just plain old joy. Everyone was focused on the labour and craft. Work was steady and went on all day in the heat. The gear is mundane and specific. Plastic tubs, straw brooms, dust pans. Cheap domestic plastic. Geologist's hammers and Dentist's picks – tools borrowed from other professions. Did they have their own tools? Maybe glue and acetone – old-fashioned and highly flammable. Lots of cartography and field notes. Hands-on labour.